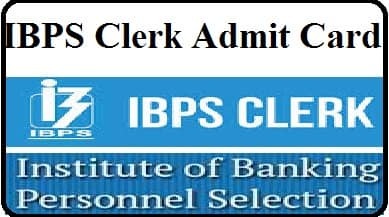 IBPS has issued the IBPS Clerk Admit Card 2018 for the Clerk Prelim Exam. Candidates who have applied can download their Admission Card (IBPS Admit Card) IBPS official website by visiting. The examination will be conducted for the recruitment of 7275 clerks in 19 banks. The clerk prelims examination will take place on 8th, 9th, and 15th December. IBPS has also started training for the IBPS Clerk Exam. This training is going to run until 1 December 2018. Candidates can download the IBPS Clerk Prelims Admit Card from the steps given below. 1) Candidates to download their Admit Card, go to IBPS's official website IBPS.IN. 2) Click on the link for Online Preliminary Exam Call Letter for CRP Clerk VIII given on the website. 3) Submit the requested information. 4) Admit Card will be generated on your screen, you can download it. Candidates can also download their Admit Card by clicking on Direct Link below.